Distributed by Waves in the US, Canada and Latin America. For other regions, contact SoundStudio.com. 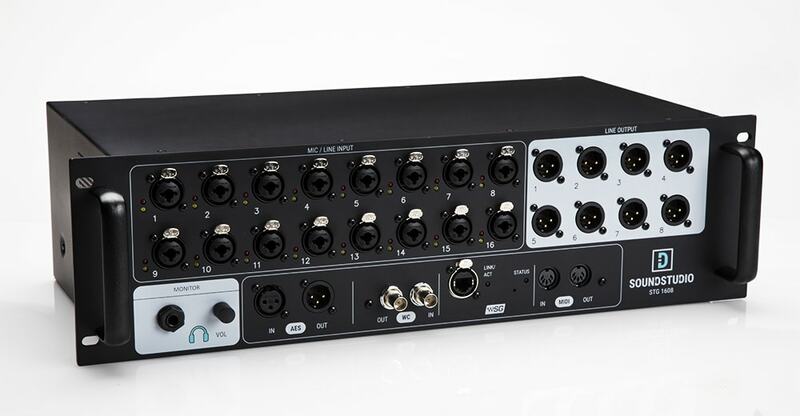 3U rack-mountable stagebox with 16 mic/line ins, high-end digitally controlled preamps, 8 line outs, and SoundGrid connectivity for real-time plugin processing and monitoring. 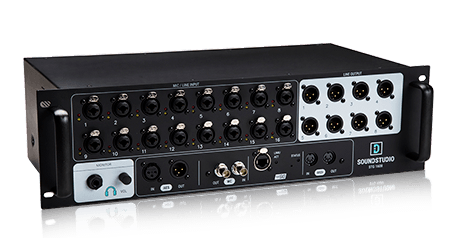 The built-in SoundGrid card allows you to quickly interface with the eMotion LV1 live mixer or any other hardware or software in your SoundGrid network. Connect a single Ethernet cable to easily record, mix and monitor live or in the studio. Built to endure the punishing road, STG-1608 is designed to provide consistent top performance and high-quality sound, day in and day out. For more information on SoundStudio stageboxes, visit the SoundStudio website. SoundStudio I/Os require a SoundGrid driver installed in order to function. To install the driver, follow these steps. In the below setups, on-stage instruments and microphones are connected to the STG1608 which is remotely controlled from the LV1 mixer at front-of-house. The audio is processed on a SoundGrid Server and then outputted to stage-monitors and/or the PA system. An optional DAW computer (with the SoundGrid Driver installed) can be added to the setup for recording the show, playing back audio and for virtual soundcheck. For complete information on supported cable types and lengths, visit the Ethernet Cables for SoundGrid Systems page.